These are our finds from week 26. Xander, being a one and a half year old boy, is in the stage where he thinks sneezes are hilarious. He often pretends to sneeze, getting his whole body into it. This book was perfect for him! It is about a zoo that has a sneezing fit pass through it, affecting all the animals. He enjoyed the sneezing on each page. It also had things going on on various pages for him to point to, such as balloons, brooms, animals, etc. I am really starting to love these A+ books! They all have fantastic pictures, and clear explanations of the concepts. Sorting By Color is no exception. The book talks about different types of objects that can be sorted by color. It also introduces the idea of a Venn diagram and sorting by color that happens out in the "real world." With Independence Day being next week, I decided to make a few printables for Xander. Rather than waiting until after to post, I am sharing now so you have time to print and use them. I just print them on card stock and laminate them (I have this laminator and Amazon often has these laminating sheets for about 10 cents each). For the booklet, I do the same, then use a hole punch in the top left corner, and then use a binder ring to hold them together. 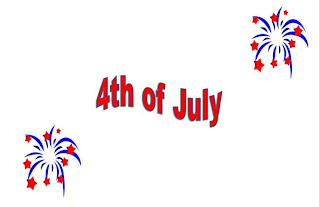 For those of you with Little Reader, I also made a 4th of July lesson that is free to download. These are the boxes from last week, so they happened during our Star Week and our Space Theme. I try to have the activities link in when I can, but don't feel constrained by making them fit. I don't intend all of the activities to be done independently. Most requiring scaffolding from me. This box had five different star cookie cutters. Xander loves his nesting blocks so much and stars are his favorite shapes, I thought he might enjoy nesting the stars. He really liked these, but nesting them was much harder than expected. We also did some size sorting. He understand the concept of biggest and smallest, but had trouble with three in between. 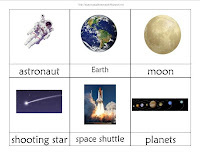 I got this solar system matching activity from 2 Teaching Mommies. Xander liked talking about the planets and watching me match them up, but didn't feel like doing it himself. During our Bee Theme, we used Xander's toob to match insects. He LOVED it, so I thought we would try again with space. This box had some cards I made to go with his Space Toob (in my Space Printables). He did enjoy it, and I would love to say that we used it all week long. However, Xander is in a throwing phase and tended to throw the figures, leading me to put them away. So we got it out a lot, and enjoyed it up until it got taken away. This box had a star ice cub tray, some pom poms, and a spoon. He had a bit of trouble scooping the pom poms (so did I) because they tended to stick together. He was very good at getting them into the stars though! This box had the rocket template to go with his magnetic pattern blocks. This week he was more into playing with the shapes than actually matching them up. I was happy to just let him play while we talked about the shapes and colors. Tot school is supposed to be fun! He loved his cutting food so much last week, I went ahead and left it out another week. Just one of the benefits of having more space for tray/box activities! No idea where this week's puzzle was from. I just chose it because it had a starfish and we read a couple of books on starfish to go with the shape of the week. One of the shelves also had this great star maze (I couldn't find a link for the star, but here is a butterfly with a similar concept). There are little magnetic balls inside and a magnetic stylus to move them. He enjoys playing with it, but sometimes get frustrated if he drops the balls. Since I am always looking for new ideas for our boxes, I decided to start a Linky. 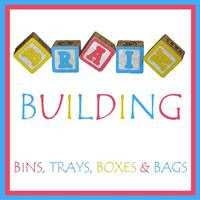 Have you posted about any sort of brain buidling work boxes, tot trays, busy bags, etc? Feel free to link up! All I ask is that you add the Brain Building Lynky button (in the sidebar) somewhere on your post. Thanks! We are currently working on shapes, devoting one week to each while also reviewing those already learned. 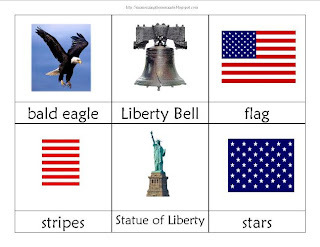 The themes just add a fun element to the shapes lessons, plus some extra vocabulary. I added a page to gather all of the Shape Posts and Printables to make them easier to find. For our overall Tot School goals for our shape units, see my Goals post. For a long time, Xander's favorite shape has been star, so I knew he would like this week. The shape was star and the theme was space. We used our shape cards. We also used some pocket chart phrases from our Star Printables. Telling me all about the stars. As usual, I made a tracing page (Cross Printables) and put it in his Dry Erase Activity Center. He just wanted to color this week. I keep showing him this type of activity, hoping we can get back into tracing eventually. I won't force him though. Coloring his star color page (in the Star Printables). He has kind of turned it into a "make a line on the shape with the correct color" page instead of actually coloring in the shape. Part of it is that he is so excited for the next marker. Playing with the Highway Shape card from Making Learning Fun. Star and rocket cookie cutters. Since there are so many great resources for space, I didn't actually make my own Tot Pack. I did make some just a few Space Printables though. I made some 3 Part Cards, and actually used them more like true 3 part cards this week. Matching the picture to the correct card was easy. He also did ok with matching the word to the picture (without the full card as a template). He matched about three of the words to the pictures immediately, but needed help with the others. I am hoping he can match all the words to the correct cards by the end of the second week on this theme. I found a package of glow in the dark planets and stars to put above his desk. You can't see the stars all too well in the pictures, but I was really impressed by how well they glowed. Xander loves pointing out the stars. 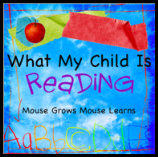 We are still using Little Reader to work on reading skills (and to make flashcards). He loved the lesson I made him to go with the Service Vehicle Them (found here) so much, that I made him a space lesson as well. Now I have trouble getting him to do his normal lessons because he wants to do the ones I made him constantly! 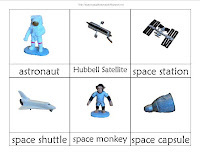 We also did a lot of space themed work box activities. I will post those on Wednesday under the new tag of Brain Building Boxes! (I also started a linky for tot trays, boxes, busy bags, etc. that I am hoping to do every Wednesday). If you don't already, I would appreciate it if you would take the time to Like Me on Facebook and Follow Me on Twitter! Thank you!